Woodfield Press, LLC is a small wholesale company that sells notecards, enclosure cards, prints, coloring books, bookmarks, paper dolls, and magnetic notepads, and Advent calendars featuring images by New Hampshire artist Cindy Hendrick. 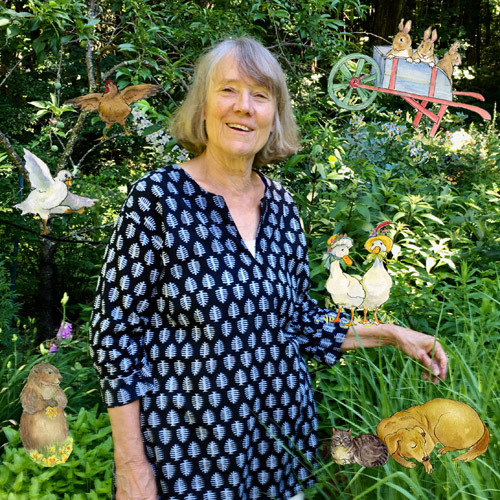 Often compared to Beatrix Potter and Tasha Tudor, Cindy’s watercolor paintings capture animals in their daily, often whimsical, lives, usually amid a nostalgic country setting. On most products, a short storyline accompanies the images, adding to the lighthearted fun. Woodfield Press products are sold at a variety of store types including garden centers, bookstores, art galleries, gift shops, and food co-ops. In business since 2004. All products are created and printed in the USA.